In July 2008 O2 announced a deal with BT to provide access to over 3,000 BT Openzone premier WiFi hotspots for all their iPhone customers. There was however a technical spanner in the works, which has prevailed in ruining this bonus ever since. The name of this ‘spanner’ is BT FON. FON is a network of community hotspots, which in the UK is mostly made up of BT Total Broadband customers. As a BT customer you can opt-in to sharing your broadband bandwidth with other FON members. 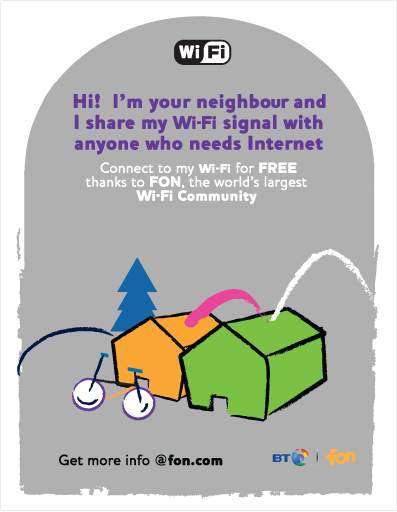 In return you have access to any BT FON community hotspot that you come across. It’s actually quite a neat idea, but the launch of this service introduced a big problem for iPhone customers trying to use the BT Openzone premier hotspots. For reasons best known to themselves, when BT set up a BT FON community hotspot they also make it act like a BT Openzone hotspot. This is fine if you’re a BT FON member as you can roam onto either of these networks, but if you’re a subscriber of BT Openzone through a partner like O2 then you only have access to the BT Openzone premier hotspots. Most smartphones remember known WiFi networks and will automatically associate with them when they are in range. The only way they have of differentiating between networks is the network name – or SSID. If you save the “BT Openzone” SSID on your smartphone then it will attempt to use a WiFi hotspot that broadcasts that name whenever it’s in range. This allows the device to seamlessly move between WiFi access points and cellular data without having to ask you each time. The problem for O2 customers is that when have registered with BT Openzone and saved it as a known network, your smartphone will blindly associate with any hotspot which claims to be “BT Openzone”. This includes the BT FON hotspots for which you don’t have access! When this happens your smartphone effectively goes offline and apps which rely on a data connection stop working until you move out of range. The only remedy for this is to remove BT Openzone from the known networks list, which is an inconvenience and negates the benefits of a BT Openzone subscription. Now finally it seems that BT are addressing the problem. They are hastily updating residential home hubs and changing the broadcast SSID from “BT Openzone” to “BT Openzone-H”. Thank you BT. It’s only taken you 4 years to sort this mess out. This entry was posted in General, Techie and tagged Android, BT FON, BT Openzone, BT Openzone-H, BTOZ, FON, iPhone, O2, Openzone, smartphone, SSID, WiFi by djh. Bookmark the permalink.